When we were in Montreal last weekend I had hoped to purchase some horse meat. In Canada it's legal to sell horse meat. It is not, of course, legal to bring it back into the United States. However, I have some little hideaway hatches in the trunk of my car that I'm pretty confident I could have smuggled them across the border in. It would have been much in the manner of the smuggling hatches on the Millennium Falcon. I'm pretty sure that Han and Chewie were mostly smuggling horse meat. Sorry, bantha meat. Sadly the horse meat was not meant to be. More on that later. Jen has been under the weather for much of the week. While I fed her matzoh ball soup I undertook the task of repurposing the Cinco de Mayo leftovers. 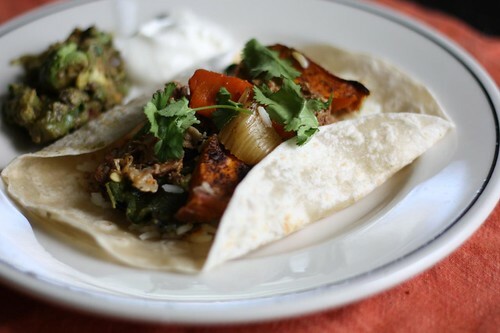 I put a helping of cilantro lime rice into a toasted tortilla shell then topped it with the chili-cumin sweet potatoes, braised veal, fire roasted poblano peppers, and fresh cilantro. On the side I served up a little of the avocado salad and some sour cream. Regretfully I forgot to put some cotija over the top. Still, it was pretty tasty. Today was the Kentucky Derby. I know this because there were a far greater number of horse pictures on Google News than normal. It was at this point that the failure to procure horse meat in Montreal hurt even more than I'd expected. Those of you that read the blog know that we love nothing more than doing a themed meal. What could have been more perfect than making a dinner of horse meat for the Kentucky Derby? Unfortunately it was not to be. I know nothing about the Kentucky Derby. In fact, I'd rather watch just about anything than a bunch of horses run around a track. That being said, it was an opportunity to eat or drink something that we wouldn't normally and for some reason we are suckers for that. Since there was a big stupid wonderful horse race today I took the opportunity to make mint juleps. I used the remainder of the bourbon I'd gotten from Tuthilltown Spirits in upstate New York. 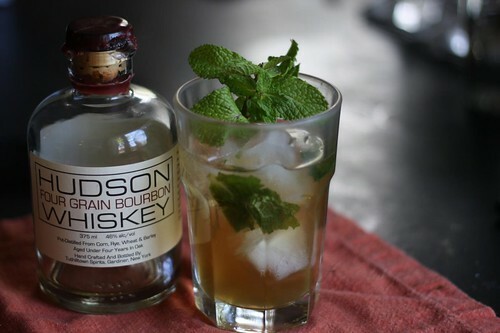 I crushed up some mint leaves and let them steep in the bourbon and then used that in approximately a 1:1 ratio with some simple syrup. Traditionally it's a 2:1 ratio of bourbon to syrup but I'm kind of a wuss. Sadly Jen was unable to taste any of the drink but she did sip a little. I had hoped the mint and bourbon would help to clear her sinuses but I think instead it did as much to ease her cold symptoms as watching the Kentucky Derby might have. 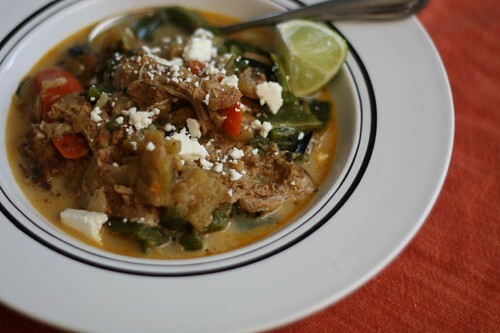 For dinner I used up the remaining braised veal shoulder and fire roasted poblanos to make this soup which I served over the lime cilantro rice with come crumbled cotija over the top. It worked well as a meal, it worked well as a burrito, and it actually worked quite well as a soup. I think this idea of braising meat using a portion of milk is something I will try again in the future. For beer I had a Blonde de Chambly by Unibroue. Instead of some musketeers on the label it features some beautiful French ladies. While I think I prefer the Noire de Chambly, the Blonde de Chambly is a little more visually appealing in that respect. This beer is, apparently, a "tribute to the young women who came from far away to build a new country." This beer is intended to pay celebration to the women who were sent by France to marry soldiers and populate the New World. 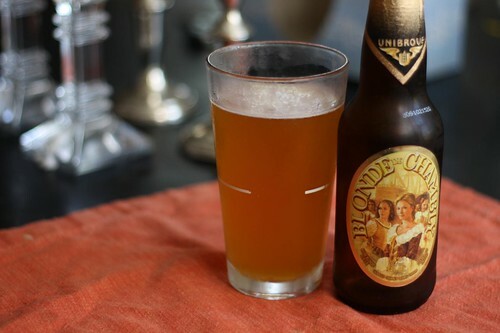 The thing I love about Unibroue is that it is not only a drink but it is also a history lesson. Now, just think how much better this would have went with some horse meat.